Team Nebraska Announced for 2018 USA Games! Special Olympics Nebraska athletes, coaches, and law enforcement prepare to depart for the Special Olympics USA Games in the Seattle, July 2018. 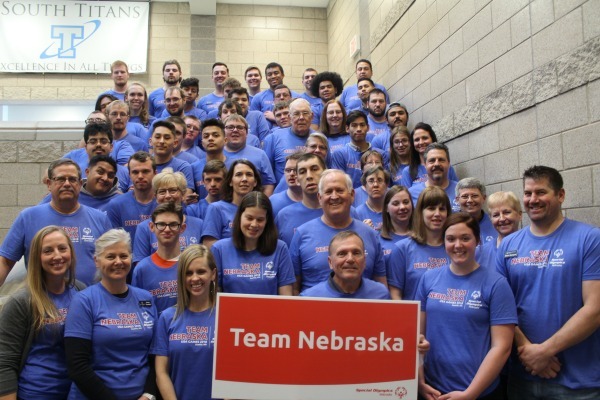 Omaha, Nebraska – Special Olympics Nebraska is honored to announce our delegation of athletes competing in the 2018 Special Olympics USA Games in Seattle. The Nebraska delegation is made up of 31 athletes, 8 unified partners, 2 Youth Leaders, and 13 coaches. Now in its fourth running, the next Special Olympics USA Games will take place in Seattle in July 2018. Past hosts were Ames, IA in 2006, Lincoln, NE in 2010, and Lawrenceville, New Jersey in 2014. From July 1-6, 2018 more than 3,000 athletes from all 50 states and the District of Columbia will descend upon Seattle and the surrounding region. Fourteen sports will be offered including athletics (track and field), basketball, bocce, bowling, flag football, golf, gymnastics, powerlifting, soccer, softball, stand up paddle boarding, swimming, tennis, and volleyball. The 2018 USA Games are expected to host 10,000 volunteers, 10,000 family members and friends and 70,000 spectators. In addition to showcasing the awe-inspiring abilities of thousands of athletes with intellectual disabilities, the 2018 USA Games in Seattle will model the ideals of inclusion and celebrate the 50th anniversary of the Special Olympics movement. The 2018 USA Games will serve as a catalyst for the City of Inclusion initiative. The 2018 USA Games will also highlight Special Olympics’ work in sport, education, health and community-building. Special Olympics Nebraska is a 501 (c) (3) nonprofit organization, which was founded in 1972. The mission of Special Olympics Nebraska mission is to provide year-round sports training and athletic competition in a variety of Olympic-type sports for children and adults with intellectual disabilities, giving them continuing opportunities to develop physical fitness, demonstrate courage, experience joy, and participate in a sharing of gifts, skills, and friendships with their families, and other Special Olympics athletes and the community.